Last week, I finished the final winter meeting of the year discussing the slate of peanut varieties available (many on a limited basis) for the 2019 season. 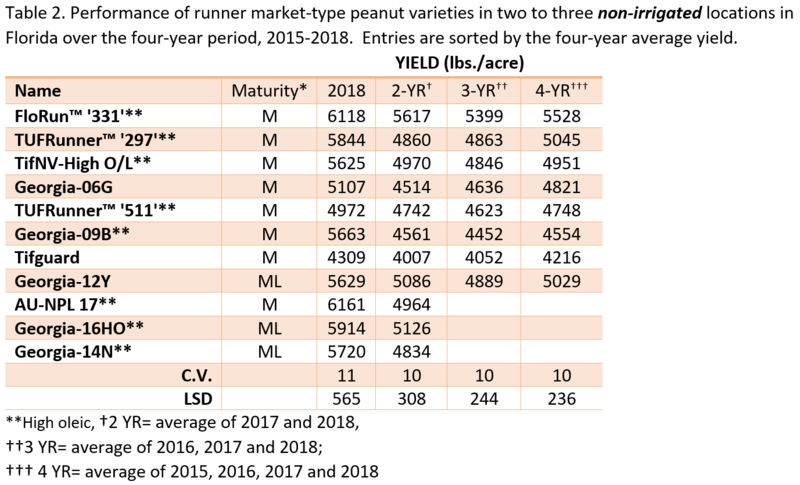 The yield test information from across the southeast shows that many of our new peanut varieties have similar yield and grade in conditions where risk of disease is low. 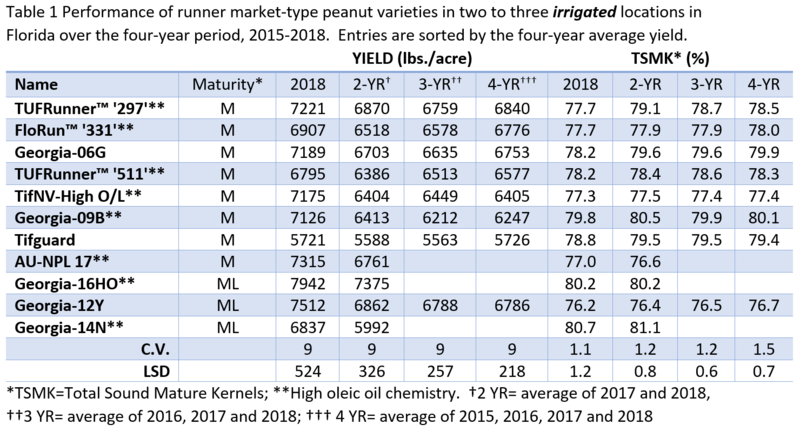 Tables 1 and 2 below summarize the most current University of Florida peanut variety performance test results. Most of these varieties have the “goods” when it comes to outright performance in optimal conditions. However, when it comes to disease tolerance, there is a lot more variability among peanut varieties. That variability can be both extremely beneficial when used correctly, and extremely detrimental if not understood. Despite the excellent disease tolerance available in many modern peanut varieties, let me say up front, that crop rotation (at least two years out of peanut or similar legume) and a timely, robust fungicide program (at least three modes of action) are paramount to good disease control. When properly selected, the variety can provide an added measure of protection and resiliency. 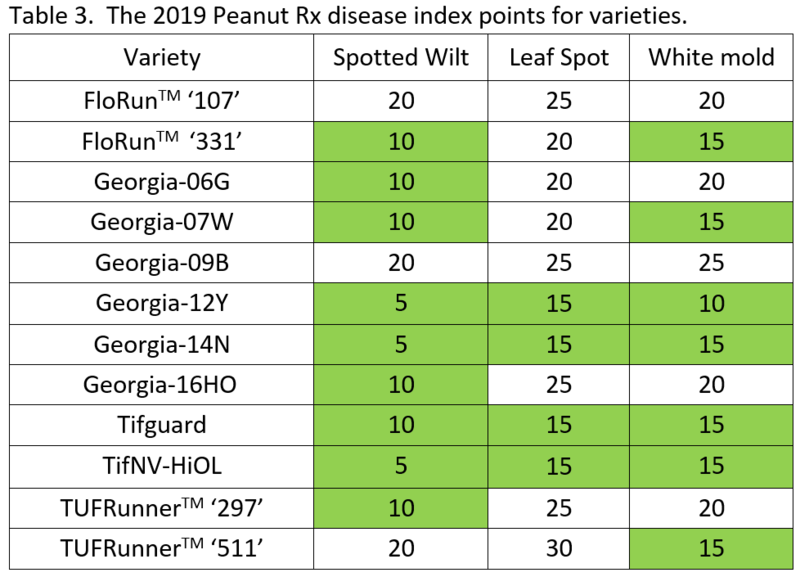 Table 3 shows the 2019 Peanut Rx disease ratings for the most common runner peanut cultivars in the southeast. The lower numbers mean better resistance and lower risk of yield loss. While all varieties will respond to a good fungicide program to control leaf spot and white mold, there is help on disease suppression with variety choice. Notice that most of the varieties have good tolerance to spotted wilt and white mold, as indicated by the green shading, but fewer have tolerance to leaf spot. Using this as a guide to variety selection could pay off well when diseases become entrenched. In addition to good crop rotation and a good fungicide program, choosing a variety with disease tolerance to match the most problematic disease you face in peanut each year should help minimize losses and maximize profits.